The season will run Sept. 15-21 with the traditional one bird per day and two-birds in possession bag limit. Every spring sage grouse descend on leks across southern Idaho for their annual courtship. Wildlife biologist Michelle Kemner-Commons describes what the pops, struts and sparring means in the sage grouse world. 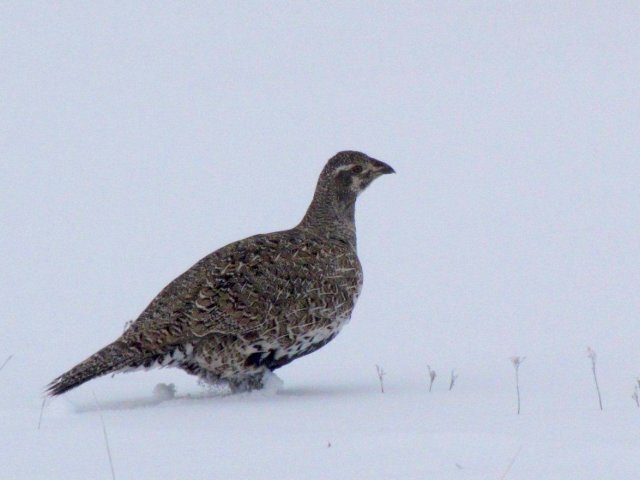 The Idaho Fish and Game Commission approved a restrictive season for sage-grouse. The 2017 season will run from September 16 to September 22, with a daily bag limit of one bird, and a possession limit of two birds. The season will take place in the same areas as last year's hunt. The Sage-grouse Seasons and Rules brochures, including a map of areas open to sage-grouse hunting, will be available soon at all license vendors, Fish and Game offices and website at https://idfg.idaho.gov/rules/upland. The Idaho Fish and Game Commission will meet Friday, August 25 at Fish and Game’s Headquarters office, 600 S. Walnut in Boise. The meeting will be held in the Trophy Room starting at 11 a.m. MDT. Commissioners will set the 2017 Sage-grouse season, approve the fiscal 2019 budget, and hear reports about the Commission challenge grant, legislative proposals, and live-streaming or podcasting of future meetings. Fish and Game is proposing one option for the 2017 season, which is the same as the season offered in 2016. Statewide, the proposed seven-day season would be from September 16 through September 22, with a one-bird daily limit within sage-grouse range, except in designated closed areas. People may encounter them in parts of Southern Idaho, and it's important to keep gates closed to keep cattle out of managed areas. Shrub plantings in the Magic Valley have been going well with just under 22,000 Wyoming big sagebrush and antelope bitterbrush plants put in the ground by local volunteers and area high school students. The plantings are intended to increase wildlife forage in areas burned by wildfires, or otherwise lacking a shrubs.There are still approximately 14,000 plants to be planted later this spring. A local television station, KMVT, did a spot on the project and can be viewed on this video link. In the aftermath of the Mile Marker 14 Wildfire near Boise and the Soda Fire south of Marsing, Idaho Fish and Game staff are looking for volunteers to plant sagebrush and bitterbrush seedlings to help restore both areas. This news release comes from the Bureau of Land Management (BLM) and provides some information that hunters may wish to review. Boise, ID -- Treatments within the Soda Fire burn area continue this fall with applications of herbicide on BLM-managed lands in both Idaho and Oregon.